The conference is organized by the Italian Associat ion of Cognitive Science (AISC), the Epistemology section of the Department of Antiquities, Philosophy, History and Geography (DAFIST), and The Human Mind Project of the School of Advanced Study, University of London. The Human Mind Project highlights the contribution of the arts and humanities to the study of human nature, and the importance of a comprehensive, interdisciplinary approach to understanding the mind, integrating science and the humanities. The conference is hosted by the School of Human Sciences of the University of Genova, with the scientific partnership of the research centre Casa Paganini / InfoMus Lab. 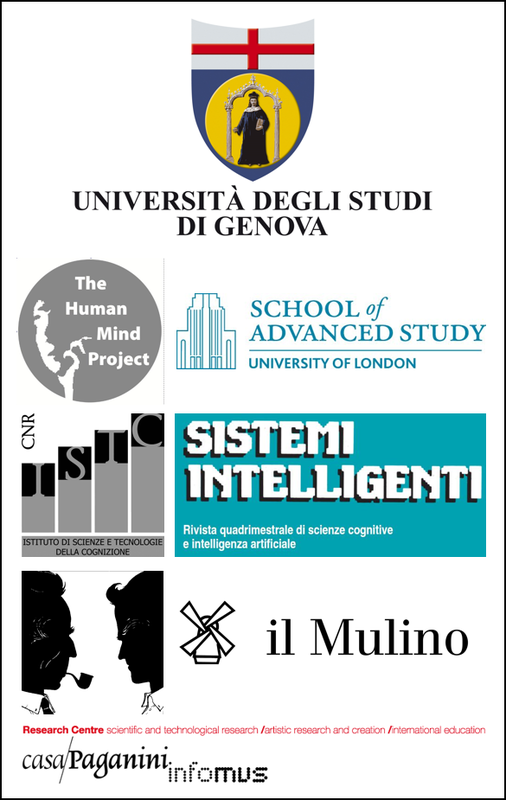 The organizers also gratefully acknowledge the financial support of the Institute of Cognitive Science and Technologies of the National Research Council (ISTC-CNR), the journal Sistemi Intelligenti, and the publisher Il Mulino, as well as the scientific support of the Italian Association of Analytic Philosophy (SIFA).